A few years ago, during a movie marathon weekend, I watched “The Long Walk Home” on one evening and “The Help” the next evening. The first movie is the story of a Black maid and her employers caught up in the events of the Montgomery bus boycott in 1955. 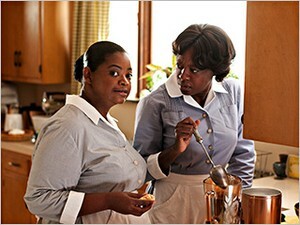 The second is the story of the Black maids (the help) who worked in the homes of well-to-do White families in Jackson, Mississippi just a few years before Civil Rights laws came into effect. It was an intriguing video study of American history, of American culture condensed into two evenings of storytelling. I recommend it. But I warn you, it’s pretty uncomfortable. Past treatment of our Black citizens is part of the American family story that embarrasses us now. I daresay, many of us good-hearted people look back and wonder how on earth so many people could have been so blind for so many years. Here’s the first irony: this country of liberty, justice and equality was built on the bloody backs of slaves. Then the second paradox: the brutal war that was fought to end the ugly business of slavery was followed by a long “separate but equal” status quo that was considered to be the appropriate (and even godly) way to order our society. Thank goodness our laws have evolved over these 200+ years to reflect a more just understanding of human relationships in this country. For example, consider our labor laws (since we are celebrating Labor Day this weekend). Thank goodness, we finally have laws that protect our children, protect our health, designate a minimum wage, regulate safety conditions in the workplace and ensure equal access to the workplace for women, people of color and people with disabilities. Thank goodness our laws have evolved over these 200+ years to reflect a more authentic actuality of the founding visions of this nation. Even though the founders did not allow women to vote; even though they allowed slavery to be part of the DNA of this nation, still they implanted genius ideals of justice and equality that have enabled this country to grow and change and become better over the years. The whole reason we have laws, I think, is because we don’t have enough love. People tend to avoid doing the loving, giving thing for others. Authentic love is counter-cultural in our human cultures, and so societies have always had to legislate how people should treat one another. Governments must pass laws in order to make sure we treat each other right and act appropriately in our various human relationships. Most of our major religious traditions call for us to treat other people in the same way we would want to be treated. But where and when is that going to happen? Even in my own Christian tradition, Christians all too often don’t manage to live up to this simple, profound practice. An excellent book written by church historian Dr. Mark Toulouse identifies four different ways American Christians have, over the years, intersected faith and politics. For example, in the earliest days, a significant stream of the church was pacifist. But then in America during World War One, preachers across the land, in both liberal and conservative congregations, pounded their pulpits and insisted it was a “Christian duty” to enlist and go kill the enemy. 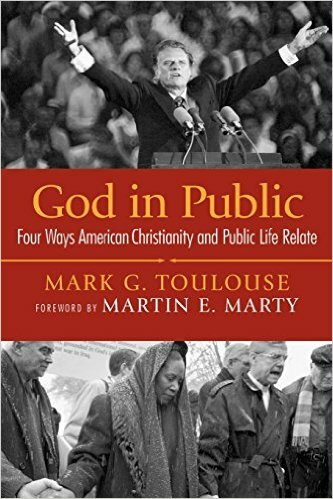 Toulouse looks closely at the history of the American church’s relationship to its government and he describes several past and current approaches that are not helpful; ways that are not at all appropriate for mixing religion and politics. But there are some intersections that are appropriate; some approaches historian Toulouse recommends to Christians and churches that are healthy options for interactions of religion with secular government. When Christians truly stand in a public Christian or a public church orientation to public life, they represent a strand of Christian understanding and theological concern not primarily rooted in cultural identities. They don’t speak or act as Republicans or Democrats or even as Presbyterians or Baptists. They do not speak as Christians who are primarily concerned with American or denominational politics. Rather they speak as Christians who believe in the meaning of the gospel. They believe that the gospel carries with it implications for how human beings, in all their individual and social relationships, treat one another…. The public Christian desires to speak about God in public ways that influence how citizens – not just Christians – think about things. 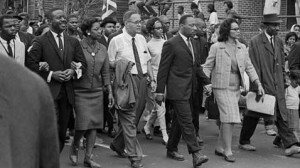 It was in large part the voices of public Christians and the public church that worked together with a broad coalition of other activists to abolish slavery, to demand the civil rights of Black citizens, to influence child labor laws, to advocate for workers’ compensation protections …and on and on and on. The Christian voice has made a huge difference in this land that we love. The church’s influence has helped change our world. 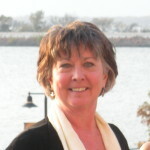 But there is another religious voice prominent in the public conversation of America. What concerns me about this voice is that it is lacking in the concept of a wider social community; it is dismissive of Christ’s demand that we “love our neighbors as we love ourselves;” that we should do whatever we can to care for God’s little ones; that we ought to go to some trouble and put ourselves at risk in order to care for those who are lost and struggling. 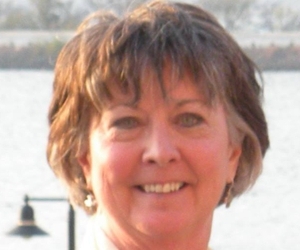 In this voice, instead of community, what we hear is insiders protecting their privilege. Instead of compassion, we hear the voice of the powerful shouting down the whispers of the unemployed and the underemployed – neighbors who want a decent job and a decent wage and a little respect. Instead of justice and equity, this is a voice of greed and privilege. Democracy … takes for granted that reasonable people will differ in their conceptions of piety, in their grounds for hope, in their ultimate concerns, and in their speculations about salvation. Too much of our current national conversation is demeaning and divisive. Too many public people are not engaged in reasonable exchange of ideas or cooperative efforts. Too many public servants do not seem to be interested in promoting justice. Where is the voice of the public prophet calling for love, justice, compassion and mercy? Who will stand up for the vulnerable, the despised and disrespected? Both the movies I watched on that marathon weekend give powerful examples of public Christians and a public church at work in society. The Black Church in America gives us insight into what it looks like to be “light and salt” in our society. Where did the Black maids go when they had been mistreated by their employers and their society? They didn’t have legal recourse back then so they went to church. Those whom the world had beat down, the church held up. These brave and bold sisters and brothers remind us that the public Christian voice can be a voice of hope and welcome for all of God’s children; an advocate for every single American. …if we are wrong, the Supreme Court of this nation is wrong. If we are wrong, the Constitution of the United States is wrong. If we are wrong, God Almighty is wrong. So let us fight until justice rolls down like waters. This Labor Day let us celebrate all those who have worked so hard to make America strong. But let’s not just wave our flags and mouth our platitudes. Rather let us be a people who get our hands dirty actually working for the ideals this flag and this country stand for. Let us recommit ourselves to advocate on behalf of all those who want to be working right now but can’t find jobs; all those who have worked hard their whole life but now find themselves dismissed and disregarded; all those who do the really important work in our society but find they are disrespected and undervalued; all those who must work two and three jobs just to support their families. Let us be bold to raise our voices and challenge our government to keep our nation’s promise for liberty and justice for all. But today, especially for those who are the most valuable and vulnerable among us. You can blame Mark Toulouse for starting me on this journey of exploring intersections of faith and politics. I am grateful he was my teacher at Brite Divinity School and I am grateful he is my friend. 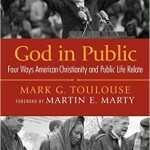 Mark Toulouse, God in Public: Four Ways American Christianity and Public Life Relate. (Louisville: Westminster John Knox Press, 2006). Jeffrey Stout, Democracy and Tradition (2004) quoted in God in Public, p. 193. 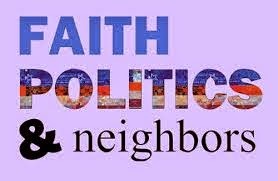 As usual, it is wonderful to see your perspective on what being Christian really is, and how it relates not just to sitting in a pew at church, but to our real lives…including politics. One way of thinking says that politics is our spirituality expressed. If you haven’t already read “Jesus For the Non-Religious” by John Shelby Spong, you might enjoy the insight there. I really like Bishop Spong Therese. I heard him speak earlier this year and he’s even more impressive in person.